Please check out Samara's GREECE Mission Nightly Update blog! 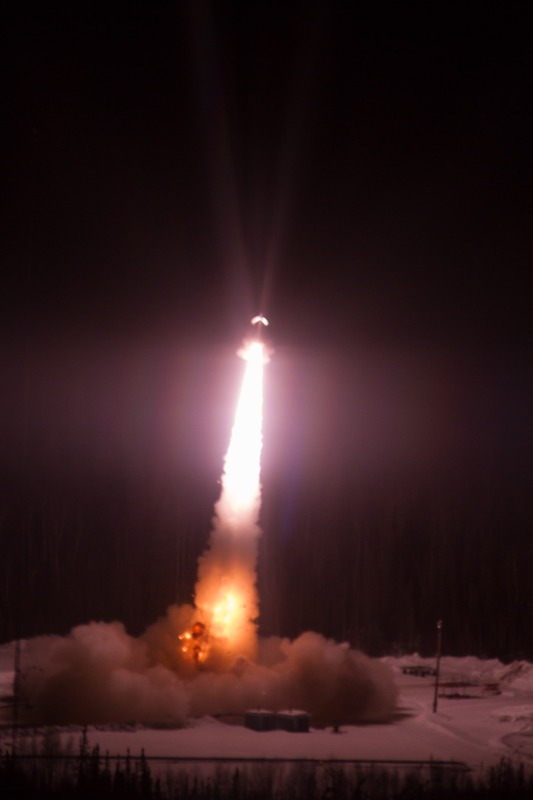 Launch planned from Pad 3 of Poker Flat Research Range, Mile 30, Steese Highway, AK. Local time at Poker Flat Research Range is Alaskan Standard Time, AKST (AKST = UT – 9H). GREECE as it takes off from the launch pad. The flight of GREECE through the aurora. 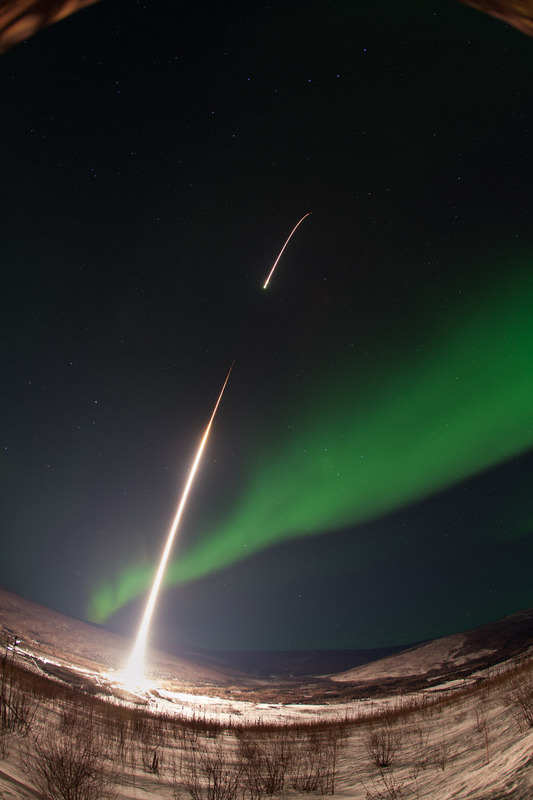 A NASA sounding rocket takes off from Poker Flat Research Range early on the morning of March 3, 2014. Vertical Check complete, 0412 UT. Solar wind and IMF conditions are promising this evening as we approach the opening of the window at 0500 UT. The IMF Bz has been southward at around -5 nT for the past 6 hours. Solar wind speed has been dropping slowly from 375 to 350 km/s, concurrent with slow increase in density from around 2 to 6 1/cm3. The GOES magnetometers indicate somewhat more compression on the dayside today than yesterday, and the downward trends towards the usual minima in the midnight sector are steeper than last night, with at least one downward spike in the 0200 to 0300 UT interval. As the Sun sets here at PKR and VEN, the Little Red and Little Green Arcs of the North are already apparent somewhat off the northern horizon at both locations, and are faintly visible even to the naked eye in the fading twilight from the SOC. 0703 UT: breakup auroral activity over Canada (Ft. Simpson, Rabbit Lake, Ft. Smith) for the last half hour or so bodes well for activity here at PKR and VEN in perhaps an hour or so. IMF continues southward with somewhat lessened magnitude, running around -2 nT. Red and green arcs remain in the north at PKR and are moving to the south. Aurora at VEN shows a fair number of separate arcs with moderate amounts of structure; still not very bright, however. 0723 UT: pick up count at T-10; 0729 UT, still multiple arcs present from just to the north of zenith at VEN up to the northern horizon, fading and brightening, but still relatively faint. 0731 UT: holding at T-2 min. GOES -15 (West) continues jumpy behavior it has evidenced since roughly 0630 UT, with roughly 10 nT peak-to-peak variations. 0741 UT: arcs at VEN have faded further and retreated to the north; recycle to T-10 min. Excellent event over VEN ; flight right on in azimuth, ~335-km altitude. Vertical Check complete, 0424 UT. It's a far quieter night here than last night. IMF has been near zero or northward since early in the evening at magnitudes around 3 nT, with the solar wind blowing around 375 km/s at densities around 3 1/cm3. Both GOES magnetometer traces showed sudden downward spikes between 0000 and 0100 UT, and then have followed relatively smooth trends down toward the midnight sector. ~0920 UT: Little Red and Green Arc of the North brightening in the north at PKR, and is still in the north at VEN. Fades in intensity, 0940 UT. IMF remains northward or near zero after nearly 6 hours. Scrubbed for the night, 0941 UT. Vertical Check (VC) complete, 0413 UT. Third and fourth grade students from the Sunshine Cottage School for Deaf Children in San Antonio, TX Skyped in during the VC and talked with Samara and Michell about their predictions for this evening’s auroral activity (“yes!”) as special guests of the campaign – welcome Sunshine Cottage! Solar wind IMF at ACE has been southward at around -2 nT since ~0230 UT. The solar wind has been flowing at around 400 km/s at a density of 3 to 5 1/cm3. The GOES-13 and -15 Hp traces are following their usual diurnal trend into the midnight sector, dropping down from a high in the noon sector of around 120 nT on both SC. A modest (~10 nT) drop and release could be seen in both GOES traces between 0100 and 0200 UT, suggesting that we are getting at least some energy storage in the tail in response to the last few hours of sporadic southward Bz. 0500 UT: IMF continues steadily southward, now at more like -4 nT. Some aurora is beginning to show up in northern Canada to our east and so if conditions continue like this, we are likely to rotate under regions of good auroral potential this evening. And – the Little Red Arc of the North has joined us as of ~0430 UT, coming up out of the sunset like a dear old friend. 0617 UT: Both the Little Red and Green Arcs of the North are here, and have moved down from the north at both PKR and VEN. IMF continues southward, at around -4 nT, with solar wind conditions remaining relatively constant (~400 km/s, 3 to 5 1/cm3). Downward trend in GOES magnetometer data continues and is steepening, particularly GOES-15 (West). 0730 UT: at 0722 UT, picked up count from T-10 min and brought down to T-2 at ~0730 UT. Structured arc is parked in zenith at VEN for past 5-10 minutes. GOES trends flattening. 0736 UT, VEN arc curled in west, narrow features present near zenith in DASC, continuing to hold steady in position at or just south of zenith. 0741 UT, VEN arc brightening and moving to south. 0743 UT, transeitn brightening of arc at zenith at PKR in the west. 0747 UT, GOES trends start to head upward. 0755 UT, arcs have moved north from PKR and are north of zenith at VEN; 0757 UT, recycle count to T-10 min. 0853 UT: southern boundary of diffuse precipitation south of zenith at PKR brightens into arc; pick up count from T-10. 0910 UT, holding at T-2 minutesarc to south of zenith ar PKR continues to gain definition and brightness. Arcs on northern horizon at PKR and to north of zenith ar VEN are overhead at TOO. Both GOES magnetometers continue upward trend. 0901 UT: holding at T-2. 0932 UT: Right Arc, Wrong Zenith. 0942 UT: Recycle to T-10. 1002 UT: pick up count at T-10; 1010 UT, hold at T-2 min. 1037 UT, pick up count at T-2 min; 1038 UT, hold at T-1 min; 1040 UT, recycle to T-2 min; 1052 UT, recycle to T-10 min. Aurora over PKR transitioning to pulsating forms. Scrubbed for the night, ~1110 UT. Vertical Check complete, 0415 UT. Expectations for an interesting night of launchable conditions are again high, especially since the CME impact earlier today around 1600 to 1700 UT. Solar wind speed is holding between 450 and 500 km/s, with a reduction in density from 10 to 3 1/cm3 around 0200 UT, coincident with a northward turning of the IMF and a slow reduction in IMF magnitude from a high of around 15 nT around 0000 UT, to just over 10 nT currently. 0700 UT: Little Red Arc of the North has been visible on the far northern horizon at PKR since at least 0440 UT in both the ASC and MSP. After a few steady hours on GOES-13 and -15, the traces have begun to trend again around 0630 UT, GOES-13 upward (it’s past midnight sector) and GOES-15 downward (still coming into the midnight sector). At 0640 UT, a strong southward turning of the IMF from +10 to -10 nT was accompanied by an increase in solar wind density from a few to ~10 1/cm3, while the speed held relatively steady at around 475 km/s. A very promising turn of events! 0715 UT: northward turning to Bz ~ 0 nT; 0730 UT, GOES-15 starts trending downward; 0801 UT, brightening in the east; 0811 UT arc between PKR and VEN. 0837 UT: pick up count at T-10 min; 0845 UT, hold at T-2 min; 0853 UT, tall red rays in foreground of green arc to the north; many tall red rays across the whole sky and arc pattern turns nearly N-S; 0916 UT, gyro package off for cool down; 0923 UT, out for wind variablity; 0928 UT, back in for winds; some arcs continue to form and move to the south at VEN, but region to the south remains chaotic and appears to be transitioning to pulsating aurora; 0932 UT, recycle count to T-10 min. Scrubbed for the night, 1101 UT. Vertical check complete, ~0400 UT. Expectations for an interesting night are high due to the potential glancing impact of the Coronal Mass Ejection (CME) thrown off by the X-class flare that occurred earlier this week. Impact was predicted to occur at around 0000 UT on 27 Feb 2014, but as of now (0446 UT) there is no clear sign in the real-time ACE solar wind and Interplanetary Magnetic Field (IMF) data of the arrival of said CME. Will we be jilted by space weather again tonight? Stay tuned! 0812 UT: Well and fully jilted we are, it seems. Things are quiet again tonight with only the faintest of arcs visible just past zenith at Kaktovik, having descended there from the north around 0620 UT. The same feature is faintly visible far to the north at Toolik and Ft. Yukon, and is not readily apparent in the MSP or ASC at Poker Flat. Solar wind and IMF conditions include smooth relatively slow solar wind at around 350 km/s and ~4/cm3, with IMF magnitudes of 5 to 6 nT, and occasional southward excursions on a mostly northward background (e.g. ~0400-4010 UT, and ~0650-0730 UT). Scrubbed for the night, ~0920 UT. Modest auroral activity picked up around 1100 UT, with arcs visible in the sky from Fairbanks after the team decamped for the night, and visible in the PKR ASC and MSP until local sunrise. It also appears that we were not jilted after all, but that the CME did get "cold feet", with an apparent arrival at ACE around 1600 UT on 27 Feb 2014, around 16 hours later than the ENLIL predictions (for example). The solar wind speed jumped from 350 to 500 km/s and the IMF magnitude increased from a few nT into the 10-20 nT range, with predominantly southward orientation. Vertical Check complete, 0402 UT (1902 local). Space weather conditions are similar to, but "less un-promissing" than last night. Over the past 5 hours (2300 to 0400 UT) IMF has fluctuating north and south, but has a relatively low amplitude of 3-4 nT. Solar wind speed is relatively low at 350 to 375 km/s and densities higher at around 5 1/cm3. GOES-13 (East) and -15 (West) Hp mag data are trending downward less smoothly than on previous night, with some abrupt changes of ~10 nT and a flat spot on both traces over the past 30 minutes or so. 0630 UT: at ~0530 UT an abrupt but modest southward turning of IMF (+2 nT to – 2 nT) occurred, with solar wind density dropping slightly and speed staying roughly constant at 375 km/s. No strong arcs in the PKR MSP, and the faint bands in the 5557 (green-line) that were just visible in the MSP at sunset and tracking very slowly southward from the far north have faded as of ~0500 UT. GOES magnetometer traces are either stalled out (GOES-13, East) or following a smooth downward trend towards the usual midnight sector minimum. 0745 UT: still very quiet locally and up the meridian; almost no auroral response in our sector to the southward turning back at 0530 UT. A subsequent southward turning at around 0620 UT of similar abruptness and magnitude should make itself felt in the next 30 minutes or so. The downrange MSP displays from Kaktovik, Toolik, Ft. Yukon, and Poker (KAK, TOO, FYU, and PKR) show the faintest of arcs moving down from the north at KAK and sitting just south of zenith or on the northern horizon at TOO for the past 3 hours or so (since roughly 0500 UT). Nothing obvious on the Venetie All-Sky camera (ASC) image as well. 0922 UT: at around 0900 UT, the Little Red Arc of the North and the Little Green Arc of the North made their first appearance of the night on the horizon at PKR, corresponding to a faint arc overhead at Toolik. Solar wind and IMF conditions are essentially unchanged with occasional and brief southward excursions in a seemingly unending stretch of geo-un-effective northward IMF. Slowly the rocket and team awakes from two weeks of slumber, folks coming in to charge batteries and pressure tanks around 1400 local, the rest of the crew on base by 1600 local. Turn On Test in shelter, completed, ~2030 local. Launcher set to nominal settings, 0324 UT. Vertical Check complete, 0428 UT. Real time ACE data indicates small IMF amplitude (few nT) and positive (northward) for past 4 hours; solar wind speed is ~450 km/s and slowly dropping; solar wind density is 2 1/cm3. GOES-13 and -15 Hp data was between 100 and 120 nT during the noon passage, and is trending smoothly downward as both satellites approach the midnight sector. 0730 UT: IMF continues northward, and solar wind continues steady at ~420 km/s; A faint Little Red Arc of the North is present on the northern horizon at PKR and has been since earlier in the evening. 0830 UT: IMF finally turns southward; magnitude stays weak (2 nT). Scrubbed for the evening, ~0940 UT. A classic "scrubstorm" or "Cleary Summit effect" auroral breakup occurred over PKR around 1000 UT as the GREECE team were cresting Cleary Summit. This display over PKR corresponded to the sudden appearance and breakup of an arc overhead at Venetie. While visually striking from both PKR and VEN, the rapid appearance and evolution of the arc over Venetie would have precluded a successful launch decision due to the rapid evolution of the arc system compared to payload time conjugate to the imagers at VEN. GREECE will return for a second window at PFRR – first scheduled night of second window is Mon, 24 Feb 2014 (25 Feb 2014 UT). Second window scheduled to run through night of 08 March 2014 (09 Mar 2014 UT). On station for Vertical Check, ~1730 local (0230 UT); Vertical Check completed, 0356 UT. 0540 UT, faint thready emissions in green and blue indicative of energetic (tens of keV) e- precipitation move slowly southward over Poker Flat (PKR). Arcs are visible and are moving to the south at Kaktovik (KAK), Toolik (TOO), Ft. Yukon (FYU), and PKR. Both the Little Red and Little Green Arcs of the North are visible at PKR, and possibly so at Venetie (VEN), which has some frost on the nothern portion of its dome, but clear skies otherwise. 0615 UT, several faint arcs visible to the north in the PKR all-sky; range is currently out for winds (booster impact location, as on previous two nights). 0636 UT, green arcs in north at PKR visible in north at TOO and FYU. 0729 UT, more and brighter arcs in the north at PKR, just visible to the naked eye; just to the north of zenith at VEN; faint red arc coming and going overhead at PKR. Many large-scale arcs filling the northern sky at TOO and FYU. GOES-15 (West) still approaching its local midnight, steadily falling with some small (5 nT) divots and jumps over tens of minute time scales. Solar wind steady at 500 km/s and around 2/cm3 for past 6 hours or more. IMF is variable but generally southward at up to -5 nT for past 6 hrs as well. 0733 UT, green arcs in north at PKR continue to brighten. Activity moving southward from KAK to TOO and FYU since 0700 UT. Wind conditions still problematic, but issue may be lifting – stay tuned! 1030 UT, arc to the north at PKR brightens and is the zenith at VEN; out by 4 deg on AZ due to winds at this point. ~1045 UT, auroral conditions at PKR are breaking up into pulsating aurora, signaling the end of the current breakup, and likely end of launchable science for the evening. Scrubbed for night and for first window, ~1045 UT. GREECE will return! On station for Vertical Check, ~1700 local (0200 UT); Vertical Check completed, 0347 UT. Window opens at 0500 UT (2000 local). Real time ACE solar wind and IMF data again look promising this evening. The IMF has been solidly southward at up to -5 nT for the past 16 hours, with solar wind speeds of up to 450 km/s and densities in the 5-10 1/cm3 regime. The Little Red and Little Green arcs of the North have been with us roughly since sundown at Poker (~0300 UT to ~0400 UT); a well-defined arc is off the northern horizon in the Ft. Yukon All Sky Camera (ASC). Skies are clear at Toolik, Ft. Yukon, Venetie, and Poker. Proton aurora, both primary H-beta (blue) and secondary green emissions are spread faintly across the sky at Poker, indicative of ion plasma sheet precipitation and a stretched tail configuration conducive to substorm activity. 0551 UT – excellent science conditions at Venetie – nice large-scale curl moving in from east on arc to the north visible at Venetie, Poker, and Ft. Yukon. Range is currently out for first stage booster impact location due to winds, and so unable to pick up the count! 0619 UT – arc to the north at Venetie still hanging in there with several knots of swirls along its length., but range is still out for booster impact location. Conditions quieting down after this initial substorm activity; range remains OUT for winds due to booster impact location. Scrubbed for the night, ~1035 UT. On station for Vertical check early; Vertical Check completed, 0430 UT. Most promising night of the window so far. Real time ACE solar wind and IMF indicated the passage of a CME earlier in the day, with continuing fast flow speeds (450 km/s), high densities (up to 10 1/cm3), and IMF Bz dipping to -5 nT. GOES magnetometer traces are radically different than prior days of the window, with compressions on the dayside ~12 hours before of 50 nT more that prior days, steep drops to 20 to 30 nT upon transiting into the nightside, and rapid drops and recoveries of tens of nT in less than 1 hour. Seeing conditions at Venetie, Poker, Ft. Yukon, and the Canadian ASC sites are all good to excellent – clear, with only the Moon to spoil the view. Toolik is intermitently foggy/cloudy. Winds are bitter, moderate, and cold, threatening to keep us from launching if science conditions are GO. 0550 UT: naked eye visible rays in arcs to the north of Poker – beautiful! 0653 UT: arcs overhead at Poker are dimmer, but still present. 0757 UT: arcs to the south at Poker brighten with nice vertical rays – STILL OUT FOR WINDS-BOOSTER (1st stage booster impact location). 0808 UT: southern arc brightens in the east and large-scale swirl propagates in around 0820 UT. Modest arc overhead at Poker as well. Both GOES have now past nominal midnight positions; sharp rebound of GOES-15 (west coast) at ~0820 UT. Stunning overhead display at Poker starting around 0825 UT, persisting through 0842 UT, arc overhead at Venetie shows just the sort of large and small scale structure and brightness that would make for a good target – STILL OUT FOR WINDS (BOOSTER). Dynamic large scale features of arc over Poker showed the pink-purple-crimson lower boarder indicative of higher energy precipitation. 0859 UT: the magnetosphere taunts us with a beautiful swirl and bright arc parked right at magnetic zenith over Ventie since 0838 UT; again an absolutely perfect launch opportunity – STILL OUT FOR WINDS (BOOSTER). 0931 UT: arc overhead at Venetie is dimmer; arcs just to the north at Poker have tall rays – STILL OUT FOR WINDS (BOOSTER). 1006 UT: bright green arc segment on northern horizon of Poker, overhead through fog/blowing snow at Kaktovik. Wouldn’t launch, but it doesn’t matter, because … STILL OUT FOR WINDS (BOOSTER). 1130 UT, Scrubbed for the night … (wait for it...) still OUT FOR WINDS (BOOSTER). Day off for the range; next night for count is Fri, 07 Feb 2014 (08 Feb 2014 UT). On station for Vertical check, ~1730 local (0230 UT); Vertical check completed, 0341 UT. Real time ACE solar wind and IMF data are quite promising this evening leading up to the opening of the window at 0500 UT. Solar wind speed has been in the 400-450 km/s range for the past 4-1/2 hours, with a solid turning of the IMF to around 5 nT southward around 0230 UT. The sky is clear at Venetie, while the sky at Poker is cloudy, with a very light and occasional snow fall at this time. 0448 UT: auroral activity picking up over Yellowknife and Rabbit Lake, several hours east of us in Canada, and a modest arc is visible in the all-sky over Kaktovik. 0602 UT: faint arc visible to the north at Toolik; modest arcs overhead and to the south at Kaktovik; Poker is still cloudy; Venetie is getting foggier. IMF continues to be southward around 5 nT; solar wind measurements are suspect, as estimated density is less than 0.1 1/cm3. GOES magnetometers are following a much more active trend than last night, with at least 70 nT of contrast from the dayside to nightside (as compared to around 30 nT last night), and rather steep transitions towards midnight, indicative of at least some tail stretching. 0912 UT: clouds over Poker clear enough and arc brightens enough to see apparent breakup over Poker; strong soft- and hard e- precipitation over Poker apparent in AMISR density profiles over altitude (enhancements at both F- and E-region heights); Counted down to T-2 min and held there for nearly an hour, watching breakups over Ft. Simpson in Canada propagating to the west, leading to faint arcs visible through the fog at Ventie, as well as general increases in luminosity visible through the low-cloud deck at Poker. AMISR radar returns then indicated a general trend in precipitation from the mixed to harder precipitation, probably hearlding the arrival of post-midnight pulsating aurora at Poker and the end of opportunities for the evening. Scrubbed for the night at ~1100 UT. On station for Vertical Check, ~1700 local (0200 UT); Vertical Check completed, 0319 UT. As of the opening of the window at 0500 UT (2000 local), real time solar wind and IMF data from ACE show relatively strong solar wind speed and field strength (350 km/s, 10 nT), although the field has been solidly northward for nearly 24 hours. Occasional excursions of the IMF towards zero and southward continue to occur, however, leading to the possibility of activity later this evening. GOES magnetometer traces over the past day have been relatively quiet; GOES-13 (LON 074 W) appears to have gone through local midnight and turned upwards at a relatively small deflection compared to previous days; GOES-15 (LON 135 W) is still working its way toward midnight but is following a similar trend. Weather and imaging at all downrange sites is good – a quick jaunt to Venetie by Michell has corrected the issues with the Digital All Sky Camera (DASC) there that arose last night. The Little Red Arc of the North has yet to make an appearance as of 0623 UT; there were some modest hints of it’s presence on the northern horizon at Poker around 0420 UT before the window opened, but nothing since. Scrubbed for the night, 0917 UT. On station for Vertical checks, ~1800 local (0300 UT, 4 Feb 2014); Vertical checks complete, 0326 UT. Real time solar wind and IMF from ACE is again promising this evening, with sustained periods of southward B-field occurring since ~2100 UT on 3 Feb 2014 (last 6 hours or more), high densities (~ 10 1/cm3), and moderate flow speeds (~350 km/s). As of 0300 UT, the Little Red Arc of the North is in residence on the northern horizon at Poker. 0709 UT – very modest and faint arcs move from north to south over Kaktovik for the past several hours, reaching overhead at the latitude of Toolik. Both the Little Red and Little Green Arcs of the North are present on the northern horizon at Poker. IMF is variable but remaining northward to neutral for the past 4 hours. Digital All-Sky camera (DASC) as Venetie has been problematic all night, and is not providing images. This is inconvenient but not tragic for science ops and analysis, as other imaging assets at Venetie and other sites can serve to call the launch. ~0940 UT – modest brightening of the dim arc to the north at Poker in both red and green lines, as well as modest movement to the south. Still well to the north, as suggested by ASc images from Toolik and Ft. Yukon, which also show an arc to the north of their respective zeniths. Scrubbed for the night, 0958 UT. On station for vertical checks, ~1800 local (0300 UT, 3 Feb 2014); vertical checks completed, ~1900 local. Appears that IP shock preceding the possible CME passed the upstream monitor (ACE) at ~0000 UT, suggesting an interesting evening’s worth of activity ahead. By the time Poker Digital All Sky (DASC) was on at ~0300 UT (~1800 local), The Little Red Arc of the North was visible, siting quietly on the northern horizon. Soon therafter, the Little Red Arc was joined by the Little Green Arc of the North (~0400 UT), sitting close to the northern horizon of Poker and Toolik. Conditions at Kaktovik were clear enough to see the arcs overhead as well. By ~0455 UT the range was out for winds; beautiful clear skies pervade Poker and Venetie, allowing for very nice optical conditions. Throughout the 5-o’clock UT hour, the green arc visible from Poker, Tooklik, and Venetie strengthened and moved somewhat southward, although remaining well north of the target area for GREECE, unfortunately. And she’ll get this rocket out of here. ~0800 UT: Moderate arc over Toolik, sitting on Poker horizon and moving slowly southward; large scale structure moving in from the east. 0854 UT, last balloon check of winds was finally back in; second balloon ascending to verify; second balloon indicated stronger winds aloft, again making the range out for winds. 0952 UT, another balloon, another wind report, bringing us back into range for winds. Scrubbed for night, 1012 UT. On station for vertical checks, 1800 local; vertical checks completed, ~1820 local (0320 UT, 02 Feb 2014). Local skies at at Poker Flat are overcast, while those at Venetie, Toolik, and Ft. Yukon are quite clear, and should provide for good observing conditions for aurora in support of any launch this evening. Real time solar wind and magnetic field data suggest an active night, with speeds approaching 400 km/s and variable southward IMF of up to 5 nT. At ~0200 UT (~1700 local), both GOES-13 and -15 Hp data showed significant drop of ~20 nT indicative of stretching of the magnetotail and energy storage. At ~0720 UT the Little Red Arc of the North made a modest appearance on the northern horizon at Poker in conjunction with a phone call from Dr. Rob Pfaff (GSFC), wishing the GREECE team well with the campaign. The north is clear, cold and dry. On the arc, north of Venetie. ~0900 UT (~0000 local) arc overhead at Venetie has developed some large-scale structures (spirals, multiple arcs). 0948 UT: picked up the count from T-10 min due to improving, dynamic, but still dim auroral conditions overhead at Venetie. Held at T-2 min until 1013 UT, at which time count was recycled to T-10 min due to fading conditions at Venetie. Scrubbed for the night, 1028 UT (0128 local). On station for vertical checks, 1800 local; vertical checks completed, ~1830 local (0330 UT, 01 Feb 2014). Real time solar wind and magnetic field has been promising but not delivering the momentum and energy transfer required to make this a special night. Weather conditions at Venetie have been poor all night, with ice fog reducing visibility to a minimum. Clouds have rolled in over Poker and Ft. Yukon as well as of ~2330 local (0830 UT). A very modest arc appeared over Toolik ~0045 local (0945 UT), probably in response to the equally modest southward turning of the IMF about an hour before. An arc in the north, no time to kill. For us on the hill. Even less for those down low. Scrubbed for the night at exactly 0113 local (1013 UT). Very quiet, except for a modest arc appearing well to the north over Kaktovik, AK around ~0000 local time (0900 UT, 31 Jan 2014). The arc moved slightly south between the Toolik/Ft. Yukon area and Kaktovik, prompting the science team to pick up the count from T-10 minutes at about 0130 local (1030 UT) and count down to a science hold at T-2 minutes. Count was held at T-2 minutes until ~0150 local (1050 UT) while the arc developed some, but remained well to the north. Scrubbed for the night at ~0200 local (1100 UT). Very quiet. Scrubbed ~0030 local. PI and key experiment team members reported for Vertical Check, ~ local; completed successfully, ~1817 local. Real time solar wind speed and magnetic field data indicate increasing solar wind speeds and stronger magnetic field strengths that bode well for increase activity this evening over previous nights. Skies over Poker Flat, Venetie, and other downrange sites clear. The range was on launch hold from ~2025 to 2120 local due to fly through of a medivac flight from Prudhoe Bay through the GREECE impact dispersion area. At ~2145 local, upstream solar wind magnetic field turned southward after a brief northward excursion. This turn, coupled with a freshening of the solar wind speed up to nearly 500 km/s suggests that increased activity will continue this evening. While exciting and tantalizing, this display did not lead to viable science conditions over the imager site at Venetie (strong, small-scale arcs), and operations were scrubbed for the night at ~0130 local. Team reports for Vertical Check, ~1755 local; completed successfully, ~1830 local. Window opened, ~2000 local (~0500 UT). Real Time solar wind speed and magnetic field data indicates relatively slow solar wind with a magnetic configuration ill-suited for coupling into the Earth’s magnetic field. This is consistent with the currently lackluster auroral activity. These displays arose after a several hour period of modest southward IMF under the same relatively slow solar wind conditions as existed at the beginning of the window. Scrubbed for the night at ~0100 local because real time upstream solar wind activity suggested no significant activity before the nominal end of window at 0200 local, which was borne out by later events. Entire team reports for group picture near PFRR Pad 5, 1600 local. Vertical check begun, ~1810 local; completed successfully, ~1835 local. Ground weather good; space weather very quiet – one very modest arc far to the north, overhead at Kaktovik. Scrub for the night due to lack of activity and probable lack of further activity for remainder of window this evening, ~0030 local. First live night of the window. Real-Time solar wind and IMF data not initially available due to outage at NOAA. 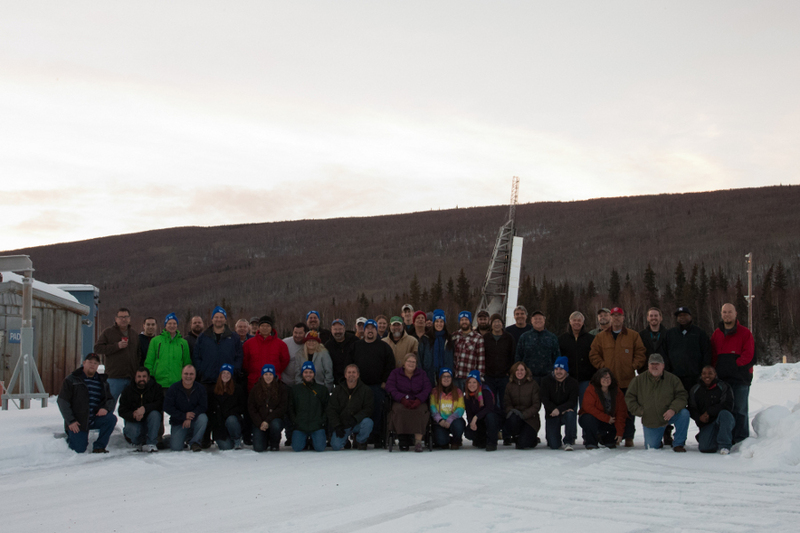 Science and Experiment teams on site at ~1800 local (Alaska Standard Time, UT-9h). Vertical Check at T-10 minutes begun at ~1958 local, completed ~2010 local. Modest aurora to the north off and on since ~1830 local; arc bright enough to see color at ~2030 local. Multiple arcs overhead at Venetie, ~2230 local; ACE real time solar wind and IMF data back on line, ~2215 local (~0715 UT); several modest “pseudo breakups” to the north of zenith; scrub for night at ~0115 local (1015 UT). Hot Practice Count successful. Stuck in town – roads outside Fairbanks were dangerously icy due to unseasonably warm conditions, cold ground, and freezing rain.